Droom, India’s first and largest motorplace to buy and sell automobiles, has been in news for quite some time for offering unbeatable offers and deals. Yet another time, you will be compelled to visit droom.in/bikemela and check out the most awaited Bike Mela. India’s Biggest Bike Mela is back on your demand, but this time the only difference is you can find bigger and better deals. Get your soul moving on a super chic motorcycle, while experiencing the power of freedom and speed. 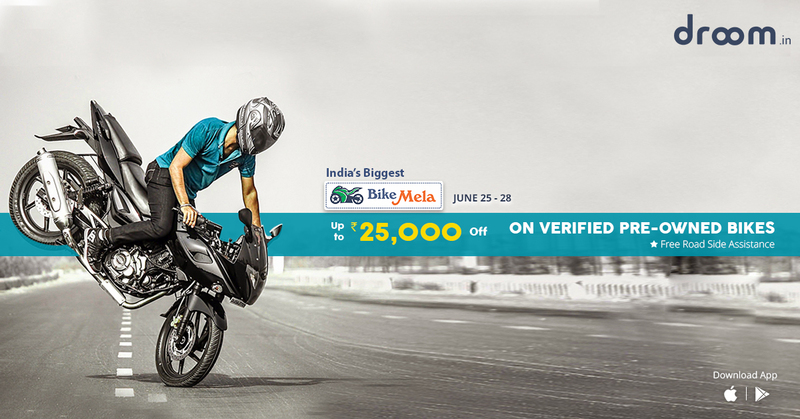 Starting from June 25, 2016 till June 28, 2016, Droom’s biggest bike mela is ought to treat you with savings up to ₹25,000. This bike mela will be available in over 30 cities across India, featuring 8000+ pre-owned bikes. Through the mela you can get your hands on sports bikes, cruiser bikes and commuter bikes. From Bajaj Pulsar, Yamaha FZ, and KTM Duke to Royal Enfield Classic, Royal Enfield Thunderbird, to Hero Passion, Hero Splendor, Bajaj Discover and Honda CB Shine, one can buy all popular models on lowest possible prices. Express your undeniable style statement on a funky sports bike or use the best commuter bike for travelling within the city. So, make sure to fix your alarms right and don’t miss out this opportunity to shop used bikes with huge discount offers. Hurry! Rolls Royce’s Surreal Take on Self Driven Cars!